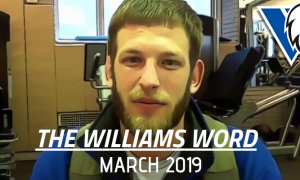 Williams Baptist College (Walnut Ridge, Arkansas) is in the process of putting together its first-ever team of Greco-Roman wrestlers and so far, there are some promising recruits joining the fray. 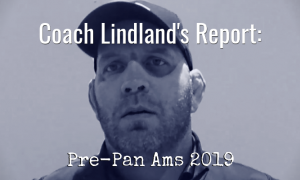 Numerous athletes with respectable, if not extensive Greco-Roman experience are coming on board, giving head coach Jonathan Drendel plenty to work with. And also, plenty to mold. At the same time, Williams has a couple of crossovers from its highly-successful folkstyle program foregoing double and single-legs in favor of bodylocks and straight lifts. A unique situation to say the least — but a situation that can be credited to both Drendel and now-former WBC folkstyle head coach Kerry Regner. 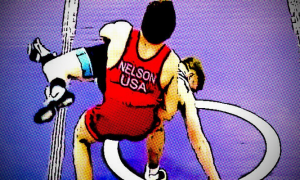 Regner, a US Greco-Roman National Team member during his competitive days and an alum of Northern Michigan, spied legitimate Greco potential in several of his charges. With the emerging Greco program needing bodies, one of those stepping up is Ryan Whittle (75 kg). 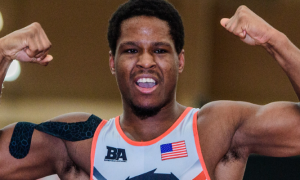 One of Williams’ most capable and reliable talents on the folkstyle side, Whittle was poised to make noise at the NAIA Nationals in March when an unfortunate injury forced him out of the tournament. With that behind him and becoming initiated into the classical style, his physical prowess as a potential Greco-Roman athlete is too evident to ignore. 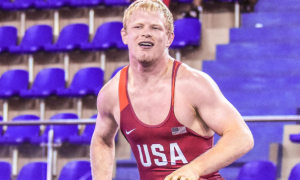 Now that he is committed to going Greco, Whittle is pumped up about the style switch and eager to get started. There are bound to be bumps in the road ahead, but that doesn’t matter. Not now. Whittle believes he can eventually become a very serious threat on the National scene and take his place on a World podium someday. That journey is about to begin. 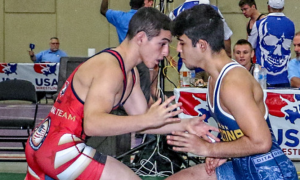 But before it does, we wanted to get his insights on what helped him decide to switch over to Greco-Roman, what he has learned so far, and how the training is different. 5PM: Okay, walk me through it. Does Regner or Drendel approach you to switch over, or did you see this as an opportunity to do something different on your own? Ryan Whittle: Before the start of the school year, I told Regner I wanted to talk to him before the season began, so I called a meeting with him and I called Drendel in, also. I pretty much told him that I’ve been wrestling ten years now and I’m not at a point in my life where I want to stop doing that. 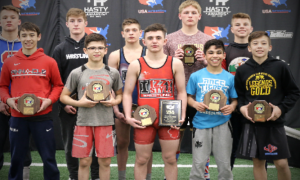 I said I wanted to wrestle for as long as I can and take this as far as I can, and with the background the two of them have, I want to be able to utilize their skill-sets and try to push for Greco and find some club somewhere to continue on after my final year at Williams. They said, “That’s great”, and that obviously, some sacrifices will need to be made. A few months later, the Greco program was announced and I jumped on the opportunity to do so. I still have a year of folkstyle eligibility left, but I don’t want to squander this opportunity to make a name for myself in the Greco realm. 5PM: What is it about Greco that excites you? RW: Ever since I started wrestling I’ve always had an affinity towards going upper-body. Coach Regner would always be on my case about me needing to take more shots. It’s not that I’m bad at it, it’s just that I like upper-body positioning and all that. Throws are fun. I think it’s a cool way to assert your dominance on someone, I don’t know (laughs). 5PM: How has the learning curve been? Outside of the legs, obviously, what are you noticing in your game that requires constant adjustments? RW: Positioning. It has to be positioning. It’s so different, even the stance. Par terre, how about that? Par terre has been really tough on bottom. It has been really tough for me. But when I am on top, I have a pretty good side lift. Coach Regner said I have a natural side lift that works well for me. But yeah, I guess just adjusting to the rules. I don’t know how to put it into words. The timing, the length of a period, it’s a different type of conditioning. I remember the first time I went full-time Greco in the wrestling room, the first day we did matches, I remember just being exhausted. I was tired. 5PM: No, that’s interesting you say that because a lot of times the conditioning factor skews towards scholastic wrestling, but Greco is underrated in this regard. It’s constant core, right? RW: Absolutely, absolutely. That’s a good way to put it. 5PM: Did anyone in your life think you were nuts for switching styles like this? Or do you just see it as the perfect time in your wrestling career? RW: No one in my family is big into wrestling. My dad wrestled a little bit in high school, but he was nothing amazing. I’m the one who started and I’m really the only one in my family who wrestles, and with the strides I’ve made in my career, everyone has been really supportive of the decisions that I’ve made. So it’s kind of like, I don’t really have a gauge from anyone in my family when it comes to making a decision like that. I’ll say something about my wrestling career and people will jump on board without an opinion because they just want to see me succeed. 5PM: Was there any point when this became a tough decision? Did you have any second thoughts at all? Ryan Whittle: Actually, yes. In the three years Williams has had a program, I mean, we finished fourth in the country this past year. I was ranked ninth in the country most of the year and I had my goals all year long to All-American, at least. And then I dislocated my shoulder at Nationals. Obviously, that knocked me out of the tournament. That hurt. It makes me wonder what would have happened if I was healthy. We just finished fourth in the country in only three years and we have so many wrestlers returning. I really think Williams is the team that could topple the dynasty that is Grand View, and I would love to be a part of that. But I really think I’ve solidified myself as to what Williams wrestling is thus far. I was captain of the team these last two and a half years. I know that I am a founding father of the program and if they were to go on to win a National title, I would feel just as much a part of that as anyone else who would be on that current roster. 5PM: Who in the US on the Senior level do you pay the most attention to, at your weight or otherwise? RW: I don’t want to make it sound like I fear anyone, because I absolutely don’t. I want to go out and put my name out there and make my mark as quickly as I can, but Kamal Bey crosses my mind a lot, I guess. And Jesse Porter. I’ve kept my eye on them, I guess you could say, and (Andy) Bisek is now coaching. But anyone, any of the top guys. I’m not looking at any of the guys on the bottom. I’m trying to make a World Team, I’m trying to make a National Team, and I want to take this as far as I can. God willing I am provided with the opportunity to make a Trials run, I’m going to do exactly that. Obviously, I am making these moves to make teams and win championships. I know that I am new on the scene, but I want to make big moves out here. 5PM: Going overseas is always a big thing for US athletes. Is that a priority for you eventually? Would you go now if you could? RW: Last year, the opportunity was available for us to go to Russia if we could afford it and if I had the money, I absolutely would have taken it. I just want to get matches in. I have yet to wrestle a Greco match that “means something.” I wrestled at Headlocks on the Hudson in Troy, New York a few weeks ago. I was in the Open division with one other guy. Yeah, I won four out of four matches, but it didn’t mean anything. I want to go and beat someone and carry that with me and say like, Hey, I can compete with these Senior-level guys. Overseas is where things are happening obviously on a much larger scale. It’s all going to come down to money, realistically, money and time. If I have those two things, then absolutely I’ll take those and go overseas. But as of right now, in my life, I’m about to finish up college, so there is not much on my mind other than getting my degree and seeing what’s next. 5PM: As of now, what are you guys looking at as your potential first Senior tournament? RW: I believe the Bill Farrell Memorial. 5PM: Is Drendel a patient coach in the room? RW: Drendel is an awesome coach. I think he is everything you want in a coach. Especially after being under Regner, he is able to emulate a lot of the things that Regner was able to derive from the team. Plus, having Drendel as a coach has made it an easier transition for me. Drendel wrestled with me a bunch when I was wrestling folkstyle, so him and I had a great relationship already. And obviously, he’s a phenomenal wrestler himself and very knowledgeable in the sport. But yes, he’s very patient. He’s not a yeller. He is everything you want in a coach. 5PM: Do you miss Regner? Ryan Whittle: I do, very much. I legitimately almost cried when he broke the news. I’ve known Regner for five years, it was tough hearing he was going elsewhere. But I understand it was for the betterment of his family and I support him, and congratulations to him on his new position. Follow Ryan Whittle on Twitter to keep up with his career and competitive schedule.